I had a request the other week about some freehanding. The question was really more of a how to do something, but I think it's just as important to cover the "when" to do it as well. The how is easy, the when is much more difficult. 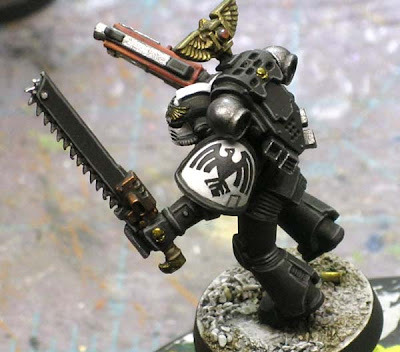 More often than not, people think of freehanding something onto their models once it's completely painted and they look at and it "looks like it needs something." 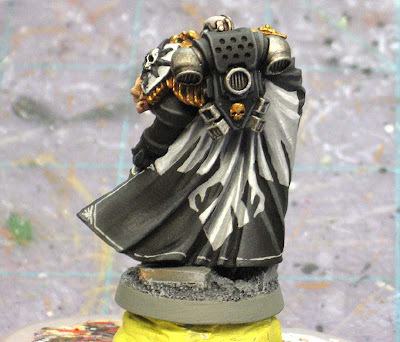 To do freehand work well, you really do need to have a plan and know when you're going to add it onto your model in addition to how you're going to do it. When you add your freehand work to your model will determine what you have to deal with both good and bad. So lets take a look at the two times I add freehand to models. 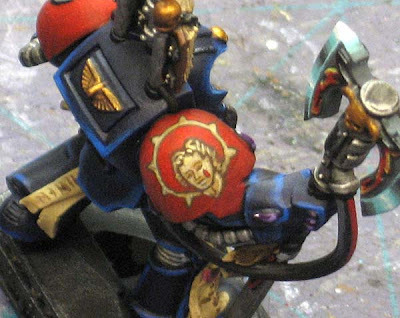 I'm going to stick to freehand painting of iconography on models and not get into banners since they are their own thing all together. 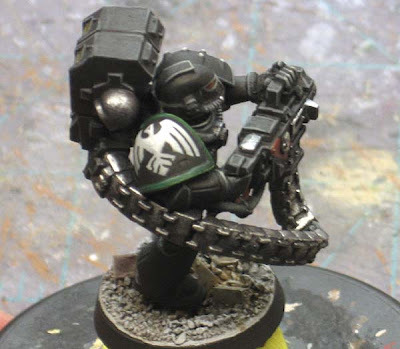 Let's use your standard Space Marine shoulderpad design. 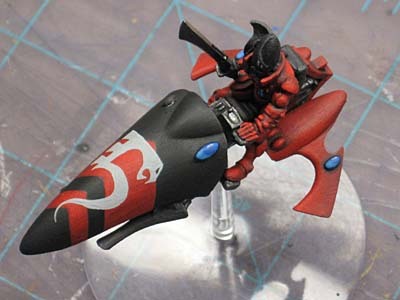 Depending on how complex your design it, you can paint it on right after you put down your base coat, but before you do any highlighting or shading. It allows you to clean up your work easily by using your base color to clean up mistakes and fix things until you have your image just how you want it. You can use the Additive and Subtractive method like the example below at this point in the painting because the basecolor does not have any variations in it that you'd mess up trying to do it this way. See how we add the box, but subtract the "x" shape from it only to go back in and add the central portion in the end. This allows us to break icons down into simple shapes that we overlap to create complex ones. You still have to highlight and shade the area with the icon already on there. This means you have to be able to work over the icon (in the case of shading) and be happy with the results or you'll need to be able to work around your icon shape on the basecoated underlying area only. Same goes for highlighting. Depending on how complex your design is, this can be near impossible. This is the way (BEFORE shading and highlighting) I would go about adding things like patterns and designs. I say most of the time since adding designs like this means you're not going to be doing lots of shading and highlighting to the area but instead letting the design be the element that carries that part of the model. It's worth mentioning how to break these kinds of things down into a system as well so I'll cover that here before we move on. When doing patterns, I find it's best to start along an edge and work from the middle outward. Pick a spot in the center of your design in a place you'll see first and start there. This is so your design looks best where people will be seeing it and any misalignments or mistakes won't be right in front of the viewer. 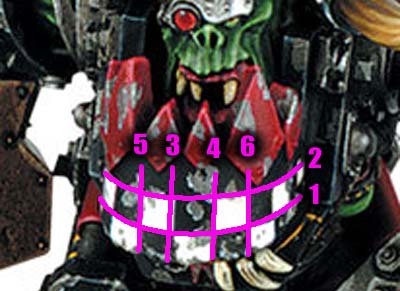 I've marked the lines in the order I would draw them to create the new Skaven triangle pattern. I'd start along the edge of that main fold in the banner. This allows me to gauge the height of all my rows above that so they are the same. Lines 2 and 3 will be based off of line 1. Lines 4 and 5 are right in the middle and set the angle for all my triangles out from there. Line 6 will be based off line 4 and line 7 will be based off line 5. All you do is keep working outward until you've covered the whole row. Moving up a row, all you need to do is extend your previous lines at the correct angle. And another pattern example. In this case it's square checkers. 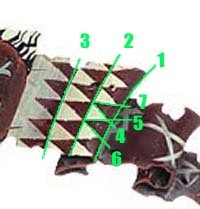 Starting with line 1, we use the bottom of the jaw as our reference point. Line 2 is gauged off line 1 for consistency. Lines 3 and 4 are made at a right angle to line 1 and are spaced apart enough so they are the same width apart as line 1 is tall. Lines 5 and 6 build off 3 and 4 and you keep working outward from there. Your other option is to add you freehand work after you've basecoated the area and added all the highlights and shadows. You don't have to worry about messing up your iconography while you try to highlight and shade the area underneath and around since it's already done. 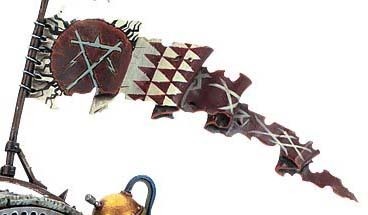 One mistake with your freehand work and you could be looking at having to repaint that portion of your model. It can be very hard to match blends and such if you make the wrong mark. It's also borderline impossible to paint designs that require you to use the Additive and Subtractive method outlined earlier. If you try this type approach after you've already highlighted and shaded the area underneath, the sections you "subtract" will not match the underlying highlighted and shaded area at all. So how do you know when to use each method? If I'm worried about getting the design just right or it's super complex, I'll do it in the beginning (before shading and highlighting) so I can clean it up using the Additive and Subtractive method. This just means I need to be careful when I go back to shade and highlight the area as I now have to work around the icon. This is when I would add patterns to an area as outlined above. If I'm comfortable painting the design... meaning I've practiced it or have painted it before and am not worried about messing it up, I'll add my freehand after I've done my shading and highlighting. Also used when I can paint the design in one pass without having to use the Additive and Subtractive method. I also add things like simple lines and edging at this point. Text (on scrolls and purity seals) gets added at this point as well since I'm generally going for a suggestion of text and not an exact word usually. While it's a fairly complex icon, I did this one after the shading and highlighting of the canopy underneath. It was important that the red stripes be perfect and the red areas be shaded smoothly before I added the icon on top. It just meant I had to be real careful mapping out my icon each time. Again, a complex icon, but it's made easy by the fact that I could clean up any mistakes I made with black around it before moving on. Take the same icon as the previous one, but place it on a shaded background and it gets a bit tougher. It's borderline impossible to clean up any mistakes with a blended background, but it's much more important that I had the white background of the shoulderpad perfectly blended and I just had to work around that. With the delicate pattern that runs around his cloak, I needed to be able to clean up mistakes as I went along. After I had the design complete, I had to carefully go in and add my shadows with thin washes of a darker grey color. You can see in the shadowed areas where the design disappears because of the shading. Flip the same model around and it would be almost impossible to blend the black cloak with the icon already on it. This means I had to paint it carefully since I had all the grey highlights on there and I had no room for mistakes. This one had the added difficulty of having to go back in and shade the icon only afterwards to give it depth since the folds in the cloak were so deep. I had to be careful not to go out onto the already shaded black areas around it. 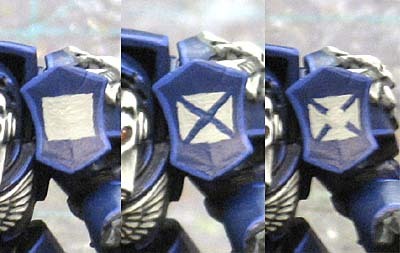 I hope this helps you figure out WHEN you're going to add you freehand to your models. Sometimes it's best to add it before you do any highlighting or shading and sometimes it's best to do it once you've already got that part done. Knowing when to add your freehand can be just as important as how you add it. Sometimes I wonder about these monster posts and how they'll be received. Great article Ron, it's a great reminder to an old painter like myself as I am about embark on a few epic freehand designs. Thanks again it is nice to have this fresh in my mind! I look forward to reading these articles, and they have greatly improved my painting. Dude! You are WAY beyond my level of work. Great post that goes beyond freehand. The whole notion of thinking of what you want your end result to be based upon design and capability is superb. Thanks for writing it -- and it wasn't too long, either. 40k Terrain: This is not beyond your skill... I think the reason people have the trouble they do is because they aren't sure where exactly or WHEN to start their freehand work. 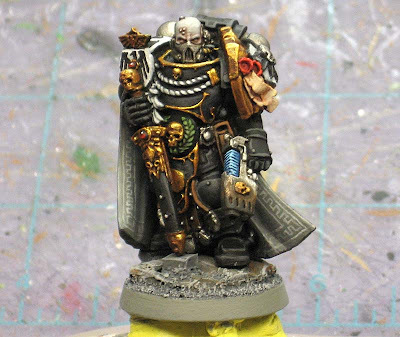 Brilliant article, can I just add with the painting on the freehand after painting the model, if you put down a gloss or satin varnish before putting on the freehand, you have a "barrier". If you mess up the freehand, hand slips or you don't think it's very good you should then be able to come back with a cotton bud soaked with isopropyl alcohol/simple green/fairy powerspray (any acrylic stripper) and lightly wipe to remove the paint. This will leave the painted work underneath and your freehand will be gone. Starforged: Now there's an idea I would have never thought of. Very cool, thanks for sharing that little tidbit.